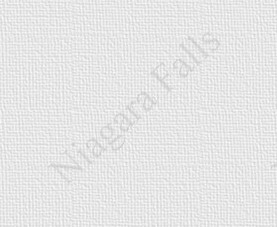 Ever since records have been kept about the history of the Falls of Niagara, there was only one time when the Falls were completely silenced and the flow of water stopped. 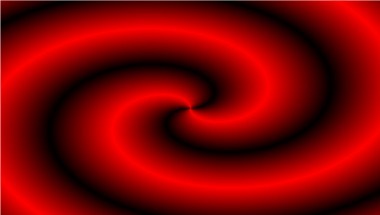 The following is the remarkable story of this natural event. Unfortunately, news reports in 1848 were sketchy at best. The exact time that Niagara Falls ran dry was not specifically recorded. It however began near midnight on March 29th 1848 and the early morning of March 30th 1848. The full effect of the ice jam upstream at the mouth of the Niagara River at Lake Erie did not take full effect until well into the day of March 30th. The water stopped flowing for approximately 30 to 40 hours before the flow of water at Niagara Falls had returned to normal on the late evening of March 31st and/or the early morning hours of April 1st 1848. 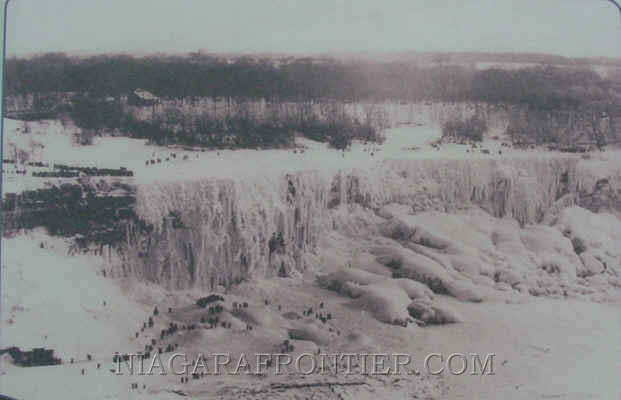 On March 29th 1848, papers reported that Niagara Falls ran dry. During a weather related occurrence, a south-west gale blowing off of Lake Erie caused ice to jam and dam up at the mouth of the Niagara River causing the water flow to be severely restricted. This caused the water over the Horseshoe Falls and American Falls to be reduced to a trickle for approximately thirty (30) to forty (40) hours. The roar of the Falls fell silent. In latter part of March 1848, a gale force wind had been blowing from the south-west for several days before the ice dam occurred. On March 29th 1848, the weather was clear with an air temperature of 7º Celsius (46º Fahrenheit). The wind was blowing very strongly from the south-west. This wind which was blowing over the entire fetch of Lake Erie combined with massive amounts of Lake ice which was in turn pushed into the mouth of the Niagara River. So much ice that the River could not handle it all so it began to jam up at the entrance. The jam became so dense with hundreds of thousands of tons of ice, that it became a water dam which severely restricted the water. One of the first residents to notice the deafening silence was farmer, Jed Porter of Niagara Falls, New York. During the late evening of March 29th, he left home for a stroll along the river near the American Falls and realized the thundering roar of the Falls was absent. A closer examination revealed the amount of the water flowing over the Falls had been greatly diminished. Residents awoke on the morning of March 30th to an eerie silence and realized something was amiss. People were drawn to the Falls to find that the water flow of the Niagara River had been reduced to a mere trickle. Thomas Clark Street, the owner and operator of the large Bridgewater Mills along the Canadian shore at Dufferin Islands was awakened by one of his employees at 5 a.m. on March 30th reporting the mill had been shut down because the mill race was empty. By the morning of March 31st, more than 5,000 people had gathered along the banks of the river. All the mills and factories dependant upon water power were stilled. The river bed was quickly drying. Fish and turtles were left floundering on now dry land. A number of people made their way into the gorge to the riverbed. Here they saw articles that had been laying on the river's bottom and had been hidden for hundreds of years. Souvenirs picked up included bayonets, guns barrels, muskets, tomahawks and other artifacts of the War of 1812. Other spectators were able to walk out onto the river bed that had only hours earlier been a torrent of rapids and would have resulted in certain death. It became a tourist and media event. People on foot, on horseback or by horse and buggy, crossed the width of the Niagara River. It was a historical event that had never occurred before and has never been duplicated since. A squad of soldiers of the U.S. Army Cavalry rode their horses up and down the river bed as an exhibition. Below the Falls, workers from the Maid of the Mist were able to venture out onto the river bed and blast away rocks which had normally been a navigation hazard to the Maid of the Mist boat since its inception in 1846. The gorge resonated with the sounds of many explosions as those rocks which normally would have scraped the hull of the boat were removed. The sudden silencing of the roar of the Falls had caused much anxiety and fear amongst the residents and visitors. Some believed that this event was the beginning of a doomsday scenario. On the morning of March 31st the Falls remained silent. Many thousands of people attended special church services on both sides of the border. With each passing hour, the level of fear and anxiety among the residents grew proportionately until the night of March 31st, when a loud low pitched growl and grown was heard coming from upstream. This announced and was quickly followed by the return of the normal flow of water along the Niagara River. A wall of water surged forward at surprising speed, covering again perhaps forever what had been exposed for but a brief historic moment in time. The return of the roar of the Falls, reassured the residents that all was going to be alright and that they could now breathe a huge sigh of relief and return to their normal activities. On the night of March 31st 1848, the wind shifted and the ice dam at the mouth of the Niagara River at Lake Erie broke apart and the river flow returned to its normal rate. On March 31st 1848, the temperature rose to 16º Celsius (64º Fahrenheit) and the wind shifted and strengthened that night causing the ice dam to break apart causing the return of the normal flow of water to the Niagara River.  The winter of 1847- 1848 was not unusually cold. Lake Erie's ice cover was not in excess of the usual 10 - 60 centimeters. The wind is the greatest factor that controls the water level in the Niagara River. A south-west wind of 30 to 50 miles per hour blowing the entire length of the Lake can easily raise the water level ( referred to as seiche or surge) in the eastern portion of Lake Erie 3 to 6 feet in several hours. Its very much like a storm water surge that we hear about during the onslaught of a hurricane however on a much lesser scale. This force pushes much more water into the river. The Niagara River can only handle about 2% of the Lake Erie ice volume. The remaining 98% of the ice remains in Lake Erie until it melts in the Spring.. The Niagara River has an average long term flow volume of 212,000 cubic feet of water per second. The average depth of the river is approximately 16 feet with a flow rate of 4 miles per hour (6 km/h) to 8 miles per hour (12 km/h). The Niagara River does not freeze over. The Falls of Niagara and the river below the Falls do not freeze either. 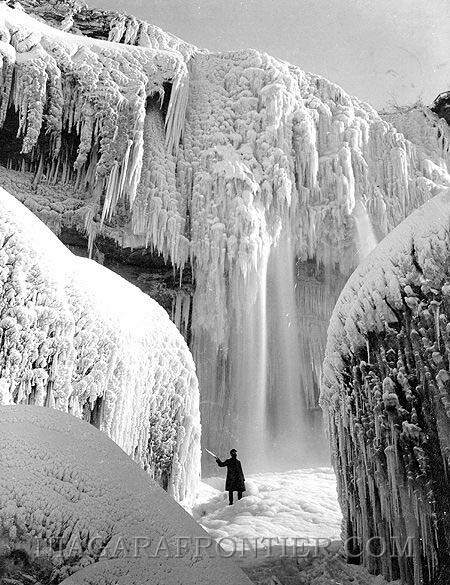 The volume of water going over the Falls, the depth and speed of the water below the Falls preclude freezing. The water will not be stopped or frozen solid except when the flow of water is significantly restricted by nature or man. Unlike the Horseshoe Falls (which has never frozen over), the American Falls are susceptible to freezing because of the small amount of water flow. Normally the American Falls has a peak mean flow of 10,000 cubic feet of water per second. The winter mean water flow is reduced to less than 8,000 cubic feet of water per second. This minimal flow is barely sufficient to cover the rock face of the Falls. During harsh winters, ice frequently builds up at eastern end of Goat Island causing an ice dam to reduce the water flow to the American channel which feeds water to the American Falls. As a result water flow is restricted sufficiently that any remaining waters quickly freeze over. As an example, the American Falls have frozen over on six occasions since the keeping of records began. Each were attributed to ice jams that have actually curtailed the flow of the American Falls to mere trickles. 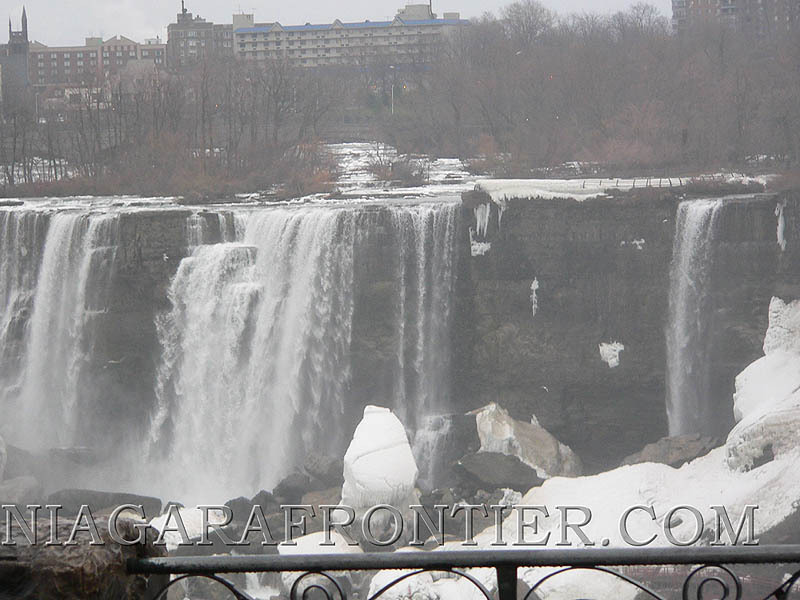 The American Falls water flow was reduced to such an extent in 1909, 1936, 1938 and 1949 that it froze over. During the 1950's, the water over a portion of the Horseshoe Falls nearest the Table Rock Pavilion and Terrapin Point was redirected by the building of a series of coffer dams to allow for remedial work to be done to the edge of the Falls. This was done to allow a more even water flow and to slow the rate of erosion. In 1969, the US Army Corps of Engineers built a cofferdam which stopped the water flow over the American Falls to a mere trickle. This was done to allow a study of the rock formations at the crest of the Falls and to study the feasibility of whether there was any possible way to remove the rock (talus) at the base of the American Falls. In the end, the engineers decided to let mother nature take its course. Today, man has the ability and technology to redirect, divert and dam the waters of the Niagara River. The dam option was considered once in the last 100 years and was quickly abandoned because of the consequences. Currently a minimum of 50% of all the water in the Niagara River is being diverted for hydro generation, municipal and industrial purposes. Nature is unpredictable. Unless it ever repeats itself to cause Niagara Falls to fall silent, the waters will continue to flow.